Here is my pair of Ear Trumpet Labs Edwina microphones. The Edwina is a very sweet and smooth-sounding condenser. And you know how I feel about smooth-sounding microphones these days. The very first thing I did with this microphone was to deface it. I put a little red dot on the front. I do that for two reasons, one is to mark the microphone as "mine", and the other to indicate which side is front. If you're listening to the mic it's very easy to tell which side is front. 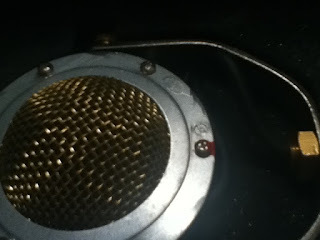 If you're just looking at it (which is how I do most of my band recordings) you have to know which way the bolts go in. And I know I'll never remember that. I'd wanted to try them out on the Russian Chamber Chorus of New York. But FedEx didn't deliver until this afternoon.